It’s not often I get to say something positive about the internet. Such was the case in my recent dealings with Hike Moab, a trail guide service in Moab, Utah. I came across this site in a recent image search I made while composing a post for another entry in this blog. I searched for “the fiery furnace arches,” hoping to discover not only some new ideas about photographing it, but also which of my own images showed up in the search. I do this periodically not just out of vanity, but also to weigh my search engine optimization (SEO) success. 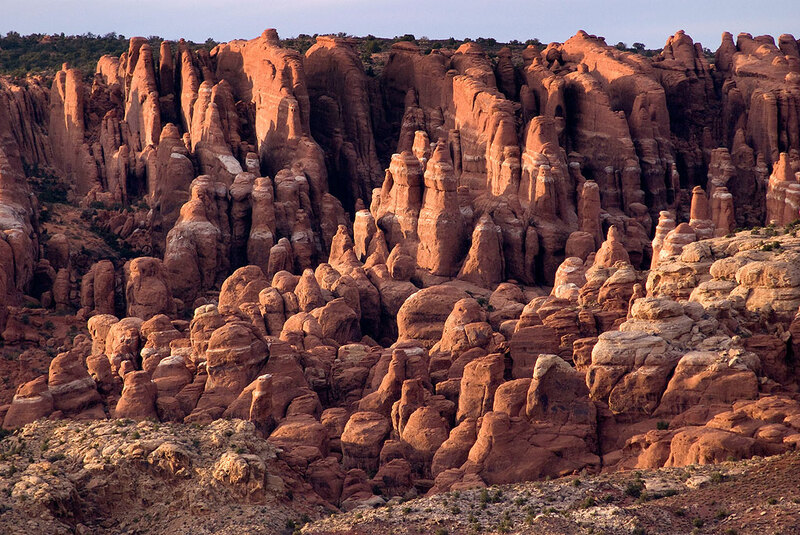 The Fiery Furnace, a maze of sandstone fins in Arches National Park, takes on amber hues as sunset approaches. I made this image in April 2011, on a trip called Art in Every Stone, which I made with Robert Stinson. I moused-over the image, expecting to see richardbarron.net. Instead I saw moabhiking.com. I clicked through to find my image on a page promoting the site’s Fiery Furnace guided tour. Obviously they did an image search as well, found this image, and grabbed it for their page. I composed an email to the address on the site, politely asking them to remove the image, which is good practice. I didn’t expect to hear back from them. I did think it odd that a company that gives guided tours of amazing places like The Fiery Furnace didn’t have their own images of it. I checked the site, and it was, in fact, removed. It wasn’t what I expected, but something I definitely appreciated. In the digital age, we expect intellectual property theft to be rampant and unchecked, but once in a while it’s great to find someone who does the right thing because it’s the right thing. Props, Mac! And thank YOU Richard for the props! I’m actually super glad to see artists standing up for their intellectual property, it is a craft that is under appreciated and it’s far too easy to mistake someone’s hard work for free images if new web designers don’t pay attention. I should have done more research before I started slapping images on my site, and as business grows (fingers crossed), I hope to be able to purchase quality work like this some day and help support our artists. If you ask me, few professions are as important to our species.